The Vistas welcomes four legged or even feathered friends to reside with their owner. We understand the companionship and connection between people and their pets therefore the Vistas has a pet policy to support the success of your pets transitioning to this new home. Before deciding to bring your pet, it is best to evaluate if you will be able to care for the pet in an apartment style environment. 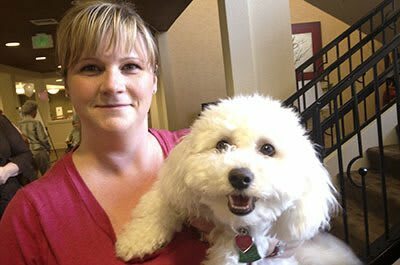 We are in the business of people first, but if you need occasional assistance with pet care this can be written into your services as an additional level of care. Meeting all of the new pets is one of our greatest pleasures, as we love your pets almost as much as you do!